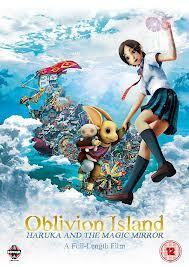 Coming of age anime in which a 16-year-old girl still grieving for the loss of her mother enters a magical world. Neglected by her father and missing the guidance of her departed mother, Haruka (voice of Haruka Ayase) sets out to try and find a precious mirror she was given as a child. Along the way she meets Teo (Miyuki Sawashiro), an unusual, fox-like creature who leads her into a magical world known as Oblivion Island where lost items from the human world are stored. The island is ruled over by a horrible tyrant. Will Haruka be able to recover her mirror and defeat the evil ruler?